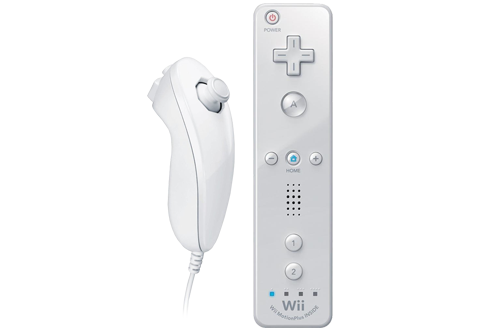 The Wiimote and extensions is a native controller for the Wii system. Many people find it's unique layout comfortable to use and, thanks to the CronusMAX PLUS, it can be used on the PlayStation 4, PlayStation 3, Xbox One, Xbox 360, PlayStation TV and Windows PC's. You will need to load a script to correctly map all of the buttons and sensors. We highly recommend this one. We get asked a lot how it is possible for an Xbox One or PS4 to read the data from a Wii USB Sensor Bar. The Sensor Bar works as a reference for the Wiimote, which has a camera on the front that is looking for the Infra Red lights on the Sensor Bar, that is how it knows where it is pointing. So while the CronusMAX does all the work in translating the signals, the Sensor Bar simply acts as a reference point to determine the Wiimote's location. It is recommended that you use a Wiimote with built in Motion Plus - otherwise the WII_IRX and WII_IRY functions will not work. The Wiimote is fully Bluetooth compatible and can be used with the CronusMAX PLUS in the same Bluetooth configuration as the DualShock 4 Controller.